Landers Chrysler Dodge Jeep Ram of Norman has an awesome selection of Chrysler Pacificas for sale! 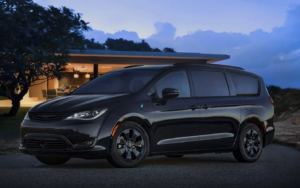 With way more than meets the eye, the 2019 Chrysler Pacifica’s sleek style, up-to-date tech, and shocking power make it one of the most sought-after minivans on the market. The most awarded minivan for three years in a row, the all-new Chrysler Pacifica will have you excited to head out on the road with loved ones and friends. Minute attention to details partnered with a spacious, comfortable cabin for passengers both ensure that the 2019 Chrysler Pacifica will be at the top of your new minivan wishlist–we pinky promise. Click here to view our awesome selection of inventory! Technology: A 7” touchscreen display with both Apple CarPlay and Android Auto sits at the helm of the 2019 Pacifica, so anyone can utilize the wireless music, phone and navigation capabilities within the van. Opt for the available Uconnect® Theater and you’ll receive a Blu-ray player as well as dual high-definition touchscreens, dual HDMI inputs, Bluetooth remotes, and wireless headphones. With all of this awesome tech, the passengers in the back seat of the all-new Chrysler Pacifica will never have to worry about entertainment on long trips ever again. Blind spot monitors also guarantee a safe journey while on the road, and rear parking sensors guarantee a safe reverse every time — both by seeing what you can’t. Thanks to all of these incredible features and more, it’s safe to say the new Chrysler Pacifica is one smart buy. Performance: Though the 2019 Chrysler Pacifica may be roomy and spacious, it’s larger size doesn’t deter its impressive powertrain under the hood. Outfitted with a 3.6-liter Pentastar V6 engine with a 9-speed automatic transmission, the all-new Chrysler Pacifica produces an impressive 287 horsepower. That means the updated minivan has a max towing capacity of 3,600 pounds when properly equipped! With sporty, nimble handling that can handle pretty much any road condition, the 2019 Chrysler Pacifica’s performance doesn’t disappoint in the slightest–especially for a minivan. Design: One of the most standout features of the 2019 Chrysler Pacifica is its modern, head-turning design. Available in eight unique and vibrant color options, it’s never been easier to match the Chrysler Pacifica to your personality. These exciting colors include Velvet Red, Granite Crystal, Ocean Blue, Brilliant Black, Jazz Blue, Bright White, Dark Cordovan Pearl, and Billet Silver. Specifically, choose the S Appearance Package which is available on the hybrid model of the Pacifica and you’ll receive a sharp, blacked out minivan that redefines cool. Gloss black accents including a grille surround, headlight accents, daylight opening & rear valance moldings grace this particular model, with 18-inch wheels that feature a Black Noise finish. It’s no wonder the 2019 Chrysler Pacifica is so highly praised. Is the 2019 Chrysler Pacifica calling your name? Just click here to visit us today–we’ll be happy to have you!